With age, the fat pad descends and inflates the under-eye skin that causes dark shadows or in other words, black eye bags. In some cases, black eye bags are not caused by fat pad inflation but by sagging of the whole under-eye skin. To remove this type of black eye bags, it is necessary to puff up the dents by injecting Hyaluronic acid. In general, Hyaluronic acid is injected in increments of 0.1 ml. However, at Theory Clinic, we inject it in increments of 0.01 ml, which requires greater skill set so as to control the amount of injection to create a natural face line. What is “Hyaluronic acid Injection”? One of the causes of eye bags is skin sagging. Due to aging, our skin loosens and forms dark shadows or shriveled area. When treating eye bags, it is important to improve skin dents and sags at the same time. Hyaluronic acid is injected both under and into the skin to lift up the dented skin and tighten sagged skin. Hyaluronic acid is composed of the ingredients that are naturally present in the human body (skin, joints, etc. ), therefore, it seldom causes allergy and has been proved safe. However, the treatment using Hyaluronic acid requires great amount of skill. 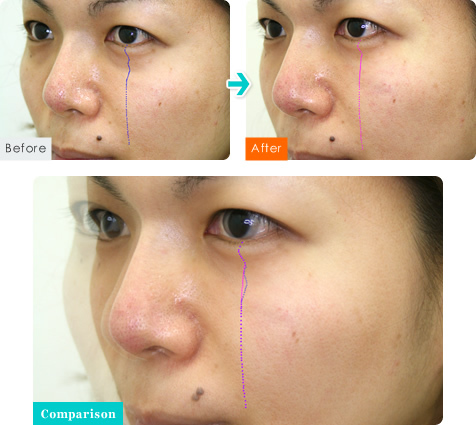 Slanting lines crossing the under-eye puff and the cheek need to be removed by injecting Hyaluronic acid. Lines are almost gone. Her cheeks look as though they are lifted up. 1. We never reuse Hyaluronic acid. To provide safe treatment, we use new Hyaluronic acid for each patient. 2. We provide various kinds of Hyaluronic acid. New products of Hyaluronic acid are introduced every year. We test all the products to know about their features and choose the ones that are best suited for our treatments. 3. We provide pain relief medication. Most patients who are reluctant to receive Hyaluronic acid injection are concerned about the pain caused by the treatment. To minimize pains, we use anesthesia containing Hyaluronic acid with pain-relieving pad. 4. Highly skilled professionals do the treatment to control 0.01ml of Hyaluronic acid. 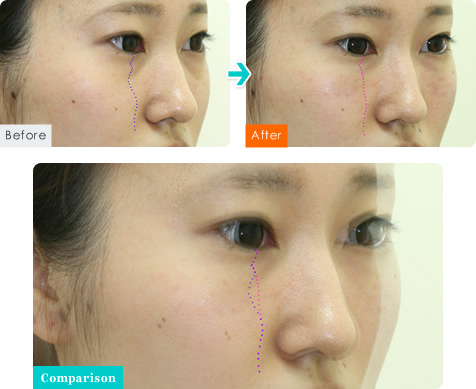 Hyaluronic acid injection should be done only by experienced doctors. Skill of the doctor directly affects the result. The severity of swelling differs among individuals. Adjustment will be done free of charge for a week after the first injection. You can wash face wash or wear makeup on the same day. Do not rub the treated area. You can either take a shower or a bath on the same day. Try to make the duration short. Characteristics: Shadows caused by dented orbits. In this case, we chose Hyaluronic acid injection instead of degreasing that would have made the dents deeper. Before and after pictures show the effectiveness of the treatment. Which is better- “degreasing” or “Hyaluronic acid injection”? Many patients like to choose Hyaluronic acid injection because of its short downtime. At Theory Clinic, there is no big difference in downtime between degreasing and Hyaluronic acid injection. We determine the best treatment method for each patient by considering such factors as the bone structure, the degree of the orbital fat pad inflation and the cheek fat condition.